As the capital of Spain, I expected Madrid to feel a lot bigger than it actually did. 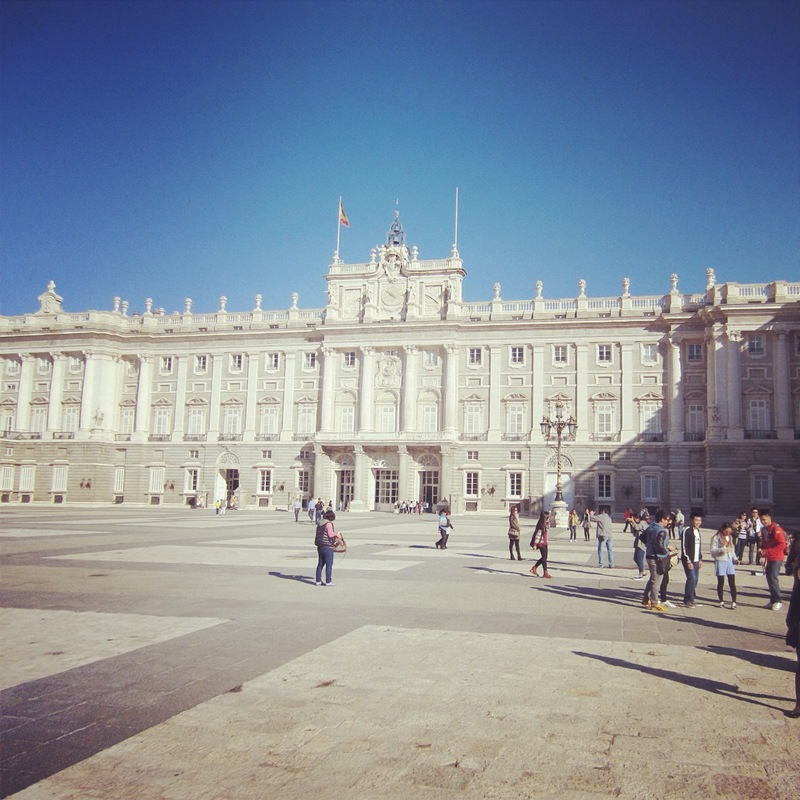 While it ranks among the top 5 largest cities in the EU in terms of both population and area, Madrid’s historic core is relatively compact. This smaller city feel is actually beneficial to tourists since many sights (and a lot of great tapas bars) are all within walking distance, making the city easy to navigate. 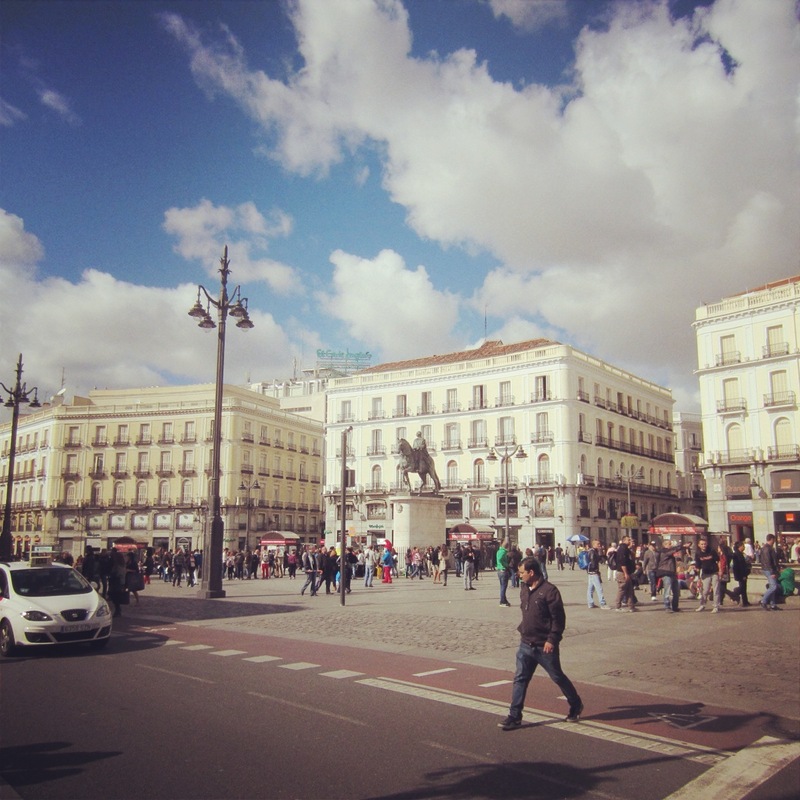 Our day started at Puerta del Sol, the bustling center of Madrid that serves as transportation hub for several metro lines with connections to the Atocha and Chamartin railway stations. Originally an east-facing gate to the city in the 15th century (hence its name meaning “sun gate”), today’s square is relatively car-free, dotted with fountains, statues and a lot of people. And like its name, all roads fan out from Sol like rays of the sun. One of my favorite highlights is Casa Diego at number 12 on the north side of Sol. The shop has been specializing in beautiful handmade fans, as well as umbrellas, walking sticks, shawls, ornamental combs and castanets since 1858. Another highlight on the east side of the square is the bakery La Mallorquina (Calle Mayor 2). Known for its signature napolitanas, it was the perfect place to stop for a quick breakfast before heading to Palacio Real. 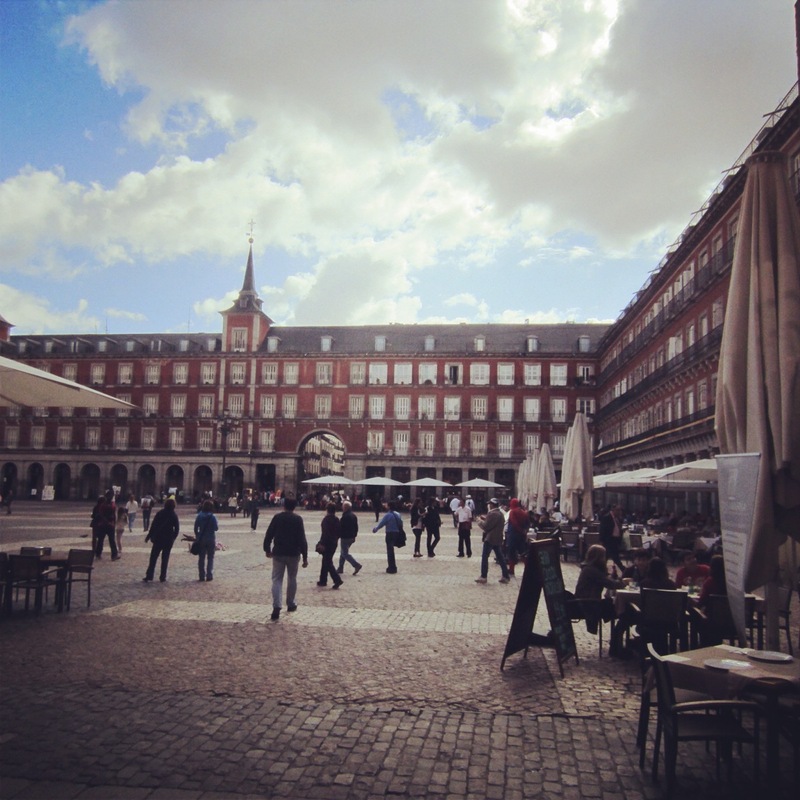 From Sol we walked up Calle Arenal through Plaza de Isabel II, home to the 1,700-seat Teatro Real opera house, and the maze of manicured greenery in Plaza de Oriente before arriving at the Palacio Real. The site has a lengthy history, but the royal palace you see today was built in the 18th century by King Philip V, grandson of French king Louis XIV. Inspired by his lavish upbringing at Versailles, no doubt Philip was accustomed to the finer things in life and wanted a palace to rival other royal residences in Europe. His son Charles III continued to expand the palace and is responsible for much of its grandiose interior décor. And with around 3,000 rooms that span nearly 1.5 million square feet, Palacio Real is one of the largest palaces in Europe. Impressive to say the least, the Palacio Real is still used today for state functions. From a visitor’s perspective, we followed the one-way route that takes you up the grand staircase and systematically thorough about 2 dozen rooms before spilling out into the main plaza. From there we also had access to the palace’s pharmacy and super cool armory, as well as terraces with great panoramic views. Adjacent to the palace is the Catedral de la Almudena, which is also worth a quick visit for its uniquely modern neo-Gothic interior. Despite its appearance, a surprising fact is that the church wasn’t even completed until 1993. Continuing down Calle Mayor our next stop was Plaza Mayor, Madrid’s football field-sized square that has been used for everything from bull fights and executions to royal coronations and other festivities. Known for its grand arcade, the square is flanked by 3-story residential buildings that sit atop traditional shops and restaurants (as well as a tourist information office on the north side). It’s an absolutely beautiful square to walk around or stop to sip a glass of wine, despite the comical and somewhat tacky street performers. Walk through the arcade on the southwest side of Plaza Mayor to Calle Toledo, a street that’s home to several other restaurants, cafes and the iconic Casa Hernanz espadrille shop at number 18. This fourth-generation family business has been located in the same spot since 1840, and its window display of handmade shoes in every color in the rainbow is a feast for the eyes. 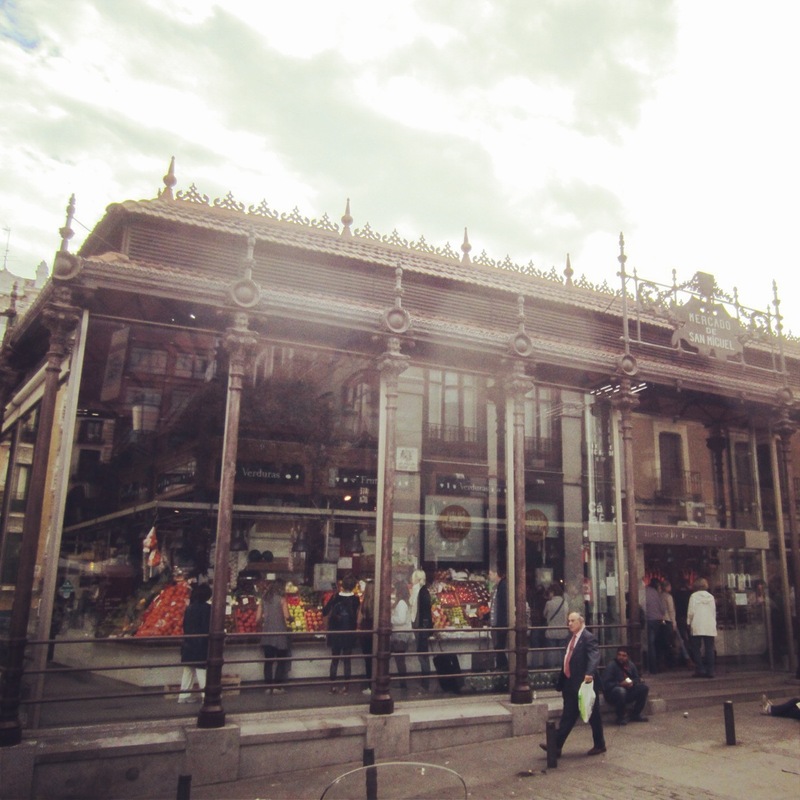 Returning to Plaza Mayor, we cut through the arcade on the northwest corner of the square to get to Mercado de San Miguel. Dating back to 1916, the iron and glass market building houses gourmet specialty food stalls that are meticulously organized by type of fare (i.e. meats, cheese, produce, seafood, nuts, pasta, etc. ), as well as several other places to order tapas on site. After surveying our options around the perimeter, we found an empty spot at the bar and ordered 2 glasses of sangria to accompany a few tapas we bought at a neighboring stall. Even though San Miguel is often crowded, its lively environment is actually half of the fun.